"It took off as I have seen it do hundreds of times before, it lands and leaves from the pitch like it does every a game." BBC football commentator Ian Stringer was at the King Power Stadium on Saturday covering Leicester's 1-1 draw with West Ham. Around 90 minutes after full-time, the helicopter belonging to Leicester owner Vichai Srivaddhanaprabha crashed outside the club's ground shortly after taking off from the centre circle. It is not yet known who was on board. "I have seen staff, backroom staff of the first team in tears here this evening," Stringer adds. "The reception area is described as silent, people are looking around and crying and not knowing what to do and consoling each other. "This is a very close football club, a tightly knit group of people. People love this guy - they pulled off the greatest sports story ever at this stadium and lifted the Premier League trophy. "The chairman looked at me today on his way to the executive box and said 'hello and good afternoon'. I said 'good luck', he said 'thank you'." Freelance photographer Ryan Brown had been at the match covering the game. "I heard the helicopter take off," he told BBC Radio 5 live. "I turned around and it made a whirring noise and grinding noise and then went silent, it was spinning out of control. "The blades had stopped spinning and then there was a big bang and a big fireball. Lots of people started running towards the scene, as I came around the corner there was a huge fireball. "It crashed right near the stadium. It just cleared the stadium roof and landed in an industrial park next to it. By looks of it, it has crashed straight into the ground." 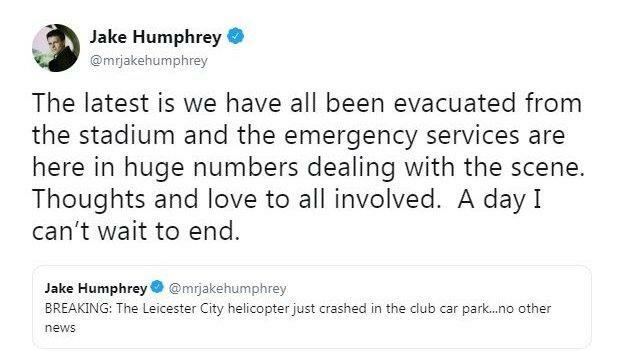 Stringer spoke to a former Leicester player who said the helicopter "took off as normal and flew over the west stand, as it went over the stand, it dropped out of the sky and hit the ground". Andrew James, Match of the Day floor manager added: "I was walking back to the car park and was aware as I got in my car of the noise of the helicopter hovering above the stadium. "I got in my car because it wasn't anything out of the ordinary and as I was exiting the car park there was a woman walking in looking towards the sky. "I said 'are you OK?' 'Can you move?. And she said 'look, look'. I looked out of my window and saw smoke initially and she kept saying 'it just spiralled to the ground'. Very quickly, within seconds of that, there was police cars." The match ended at around 19:25 BST. Afterwards BT Sport presenter Jake Humphrey discussed the owner's helicopter, from their studio at the King Power, as it took off from the centre circle of the pitch behind them. Around five minutes later, after an advert break, he revealed the helicopter had crashed. The studios were then evacuated. The helicopter crashed just before 20:50 BST. It was the second incident BT Sport staff found themselves at the centre of on Saturday. Earlier in the day, former England and Tottenham manager Glenn Hoddle was taken seriously ill after appearing as a pundit. It led BT to cancel their Saturday afternoon results programme. "Worst experience of my life," tweeted ex-England midfielder Paul Ince, who had been a guest on BT Sport on Saturday morning. "Praying for the gaffer and his family. Huge thanks to all the crew at @btsportscore." Former Wales midfielder Robbie Savage added: "Worst experience of my life today , thoughts and prayers with Glenn and his family, so proud of our BT Sport team today." Gary Lineker presented Match of the Day just hours after the crash and following the news of Hoddle, who is said to be "responding well" to treatment after being taken to hospital. "We would normally come on air and tell you about the games we can look forward to seeing in the show," former Leicester striker Lineker said. "This though is no ordinary Saturday." Clubs around the country and Europe tweeted that the club were in their thoughts, while numerous Leicester players tweeted the praying emoji. England left-back Ben Chilwell said he was "speechless". "Terrible scenes at Leicester," tweeted West Ham centre-back Fabian Balbuena, who scored against Leicester. "My prayers and thoughts go out to everyone involved." Srivaddhanaprabha, 61, owner and chairman of duty-free company King Power International Group is worth an estimated $3.8bn. The Thai businessman bought Leicester in 2010, with the club winning promotion to the top flight four years later and they then beat odds of 5000-1 to claim the Premier League title in 2015-16. Stringer said: "I'm a local guy, I have followed the club for about 10 years, I remember them taking over and have generated a relationship with them. I have seen them in Thailand and Bangkok, in their home surroundings, they are really nice people. "He [Srivaddhanaprabha] is a billionaire, very wealthy and successful man and so humble and lovely. "He celebrated his birthday by handing out cake, he bought drinks for travelling supporters, bought breakfast and scarves for those on away trips. "He wrote off the debt when he took over club from Milan Mandaric to give it a stable footing to be able to grow. He has invested an enormous amount of money. "In the last 10 days the local council approved a new £100m training ground to be developed. The chairman is the saviour of the football club and taken it to heights no-one expected." 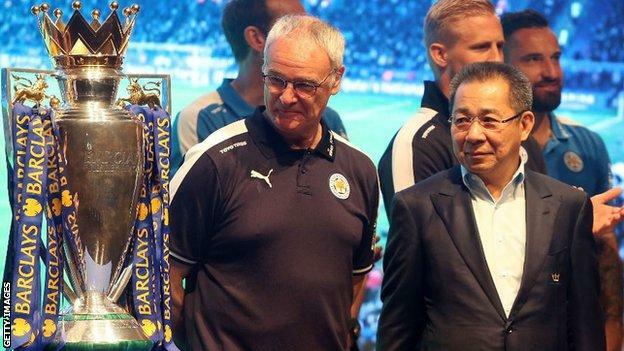 Leicester City Supporters Club chairman Cliff Ginetta told Radio 5 live: "It's such a tragedy. The family are very, very popular with the people of Leicester. They are loved by the Leicester public for what they have done to the football club and for what they have done for the city. "They have put the city on the map worldwide, they've put millions of pounds into the club and lots and lots of money into local hospitals, children's care. When it's his birthday he buys everyone in the ground a beer and a cake. At Christmas time it's free mince pies and a drink and that's the way they are. "He doesn't speak great English so he doesn't talk a lot but he certainly likes to walk around the ground and shake hands with people. He's got time for the normal fans."